"Your majesty appears to be most discomfited." An official US trailer has arrived for a French film titled The Death of Louis XIV, or La mort de Louis XIV, made by filmmaker Albert Serra. The film had its big world premiere at the 2016 Cannes Film Festival last summer. As historically accurate as they could possibly get, the film tells the story of the French monarch, played by actor Jean-Pierre Léaud. After returning from a hunting expedition in 1715, King Louis XIV felt a sharp pain in his leg. He begins to die of gangrene, surrounded by loyal followers. Described as "a wry neoclassical chamber drama, a work of pure magic". The cast includes Patrick d'Assumçao, Marc Susini, Bernard Belin, Irène Silvagni, and Vicenç Altaió. Versailles, August 1715. Back from hunting, Louis XIV (a magisterially bewigged Jean-Pierre Léaud) feels pain in his leg. A serious fever erupts, which marks the beginning of the decline of the greatest King of France. Surrounded by a horde of doctors and his closest counselors who come in turns at his bedside sensing the impending power vacuum, the Sun King struggles to run the country from his bed. The Death of Louis XIV is directed by Spanish filmmaker Albert Serra, of the films Birdsong, Quixotic/Honor de Cavelleria, The Lord Worked Wonders in Me, and Story of My Death previously. The screenplay is written by Thierry Lounas and Albert Serra. This first premiered at the 2016 Cannes Film Festival last year. 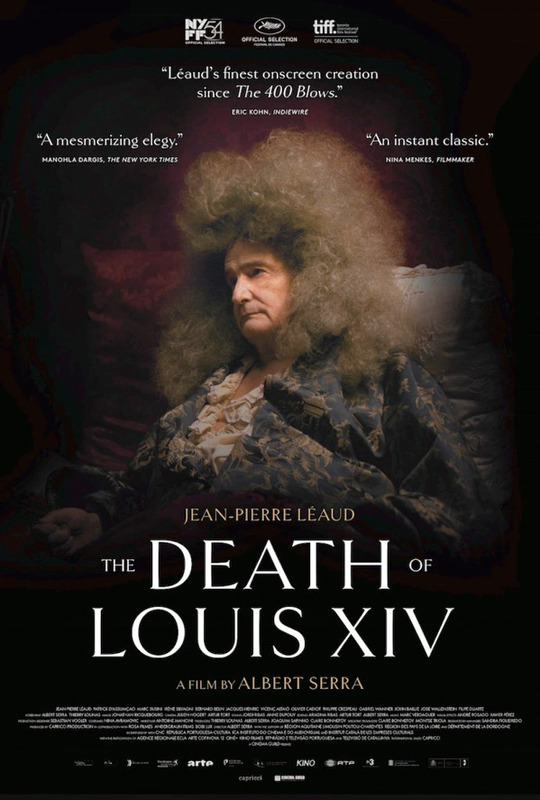 Cinema Guild will release The Death of Louis XIV in very limited theaters starting March 31st this spring. Curious?